Chanda Kocchar was sacked by ICICI earlier this week, after her indictment for breaching the bank’s code of conduct. After CBI filed a complaint against ICICI Bank’s Former MD and CEO Chanda Kochhar, an Enforcement Case Information Report (ECIR) has been filed by the ED on this matter. An ECIR is the ED’s equivalent of a police FIR. 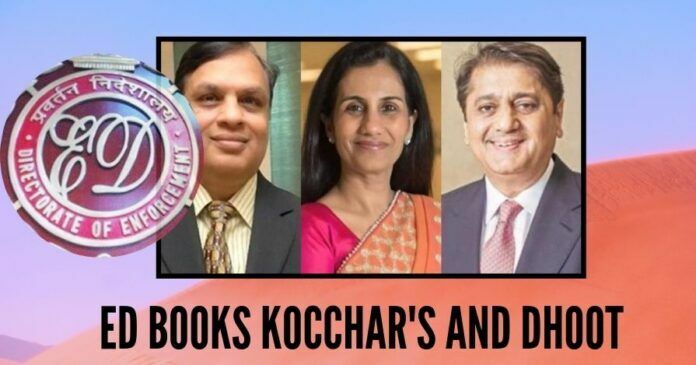 Chanda and Deepak Kochhar along with Videocon’s MD Venugopal Dhoot have been already booked under high profiled Videocon loan case by CBI. The list of accused in both ED and CBI’s are same and will be soon summoned by ED. It is alleged that months after the Videocon group got Rs 3,250 crore as loan from the ICICI Bank in 2012, its promoter Venugopal Dhoot invested crores of rupees in Nupower. The agency will primarily examine whether Chanda Kochhar made personal gains by alleged irregularities in the release of loans sanctioned by ICICI bank to Videocon in 2012 . ED will probe mainly into the funding of Rs.64 crores to Mr. Deepa Kocchar (NuPower Renewables Private Limited) through “unsecured fully convertible debentures (FCD) by Dhoot’s group company of Videocon”. As reported earlier by ET, in May 2017, a penalty of Rs 14 crore had been levied by the Enforcement Directorate (ED), Mumbai on Videocon, six group companies and promoter Venugopal Dhoot. The move had followed a reference from the Reserve Bank of India ( RBI). As part of a probe into the conflict of interest allegations against ICICI CEO Chanda Kochhar in 2016, these entities were examined by RBI. The ED penalty was on the ground that these companies had violated foreign exchange laws . Venugopal Dhoot, directors of Videocon and the six group companies were imposed with an additional penalty of Rs 45 lakhs. Venugopal Dhoot responded to the queries and told ET that they had filed an “appeal against the ED order”. He had said that the penalty has been stayed by the Court until further hearing. In a text message, Dhoot clarified that the “proceedings in question are civil (under FEMA) and not criminal”. Arvind Gupta had alleged quid pro quo against Chanda Kochhar led ICICI bank and Videocon group. He had also alleged that ICICI extended a “helping hand” to Videocon’s Tusker. A confidential report was prepared by RBI in 2016 after an investor; Arvind Gupta filed a complaint to the Prime Minister’s Office (PMO). RBI’s report added “The exposure from the Canadian and UK subsidiary of ICICI Bank Limited could not be ascertained from the bank’s books. In effect, quid pro quo by the bank in the above transaction could not be ascertained”. ICICI CBI charge sheet – could it have been filed sooner?